For the last few years, an alternate wireless network has been emerging in the U.S.: one not built by the mobile operators but by cable providers. Cablevision(s cvc), Time Warner Cable(s twc), and Comcast(s cmsca) have all launched numerous Wi-Fi hotspots in their service areas, and last week, Bright House joined the club, turning on 2,000 outdoor and indoor hotspots across the state of Florida. The Multiple Service Operators (MSOs) have latched onto the idea of Wi-Fi as a way of extending their home and business broadband services to customers on the go, and it’s paying dividends. Why haven’t their mobile counterparts followed suit? Apart from AT&T (s T), U.S. mobile carriers have been slow to adopt Wi-Fi in their networks. Verizon Wireless(s vz)(s vod) only began limited use of Wi-Fi hotspots in big public venues last year. 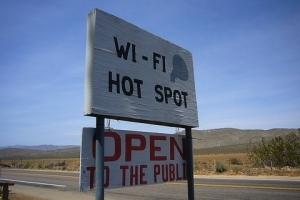 Meanwhile, Sprint(s S) and T-Mobile have been content to let their customers take advantage of the plethora of free Wi-Fi in the public domain, they haven’t launched any hotspots of their own. Even AT&T is being fairly conservative. It makes extensive use of use of the café/restaurant/airport network it acquired from Wayport to offload mobile data traffic, but it has only built outdoor networks extensively in New York City. In the rest of the country, AT&T’s outdoor access points are limited to handful of high-profile, high-traffic “hotzones” such as Chicago’s Wrigleyville and San Francisco’s Embarcadero. In comparison, Time Warner’s Wi-Fi coverage of Los Angeles is a dense mass of polka dots covering major intersections, parks and public venues from downtown all the way to Santa Monica and snaking down the coast to Redondo Beach. The MSOs have even expanded their reach by signing network-sharing deals with each another, creating the cable equivalents of roaming networks. Wi-Fi has proven to be tremendously popular with their customers, who get to access the networks for free as long as they’re home cable modem subscribers. The obvious answer as to why mobile carriers haven’t been as quick to pull the trigger the trigger on Wi-Fi is that they don’t need it from a geographic standpoint. Their networks already cover every conceivable area they could hope to reach with Wi-Fi, so the business case for carriers isn’t coverage; it’s capacity. As more customers consume more network resources, they place tremendous loads on the network’s high-traffic zones. Many international operators have already gotten wise to the benefits of Wi-Fi for cheap data offload, probably none more than Free.fr, which is building its Free Mobile unlimited and data service on the back of 5 million Wi-Fi “nano cells” embedded in the set-top boxes of its broadband subscribers. If you’re looking for an example closer to home, Republic Wireless is signing hotspot deals to create a “Wi-Fi first” service that allow it to offer unlimited voice and data for a mere $19 a month. Republic acknowledges that its service is still experimental and it’s not sure if it can make its unlimited business case viable, but if it weren’t for Wi-Fi, it wouldn’t be able to make the attempt. One of the reasons that cellular operators have not built out more Wi-Fi is that they are still wrestling with ways to make the user experience seamless for both voice and data. The handset ( or terminal in MNO-speak ) needs to be seamlessly manageable by the network operator. The back end of a Wi-Fi network has yet to be fully integrated into a MNO’s cell core net. I suspect that this will happen when VoLTE becomes widespread that Wi-Fi nets will then be embraced by MNOs.